Marilyn Cornwell Blog: Which National Day is It? That's Right - the Day the Music Died! Which National Day is It? That's Right - the Day the Music Died! That's right - it's the day that Buddy Holly and his band died. One website says that the name of the plane they were in was "American Pie." Snoops, the famous fact checker says: FALSE. The song was written by Don McLean. Don McLean himself is quoted as saying: "the growing urban legend that "American Pie" was the name of Buddy Holly's plane on the night it crashed, is equally untrue. I created the term". There's another rumour regarding the title that it was chosen because McLean once dated a Miss America contestant, appears to be equally 'spurious', according to Snopes. "... the list of people who “gave up a seat” on this ill-fated flight has grown to rival the list of persons claiming to have been invited to Sharon Tate’s “quiet evening at home” the night the Manson family struck. Although Buddy Holly initially may have asked around to find other tour members...Waylon Jennings and Tommy Allsup were the only two persons who truly “gave up a seat” on Buddy Holly’s final flight. There's a website - it is in very strange font colours that has a line by line interpretation of the song. The website home is the Wisconsin Historic Rail Connection and the photography site of Jim Kalrath. What do you think of today's image? 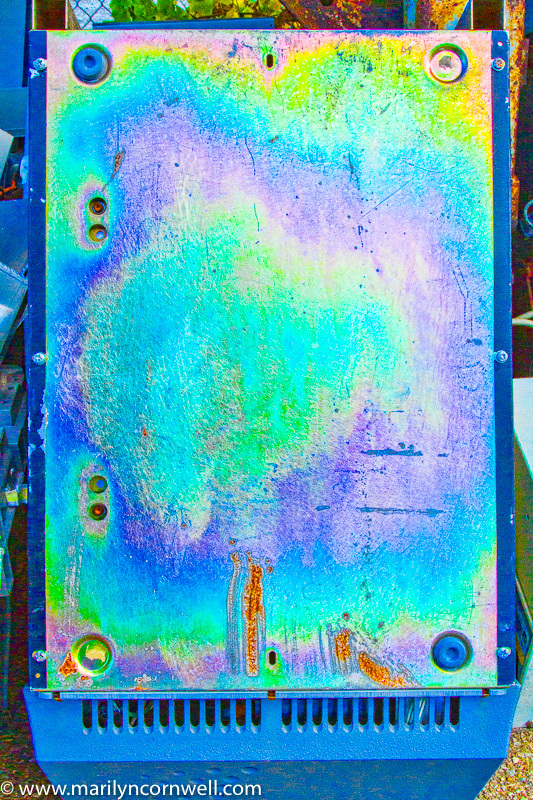 You can see the entire metal panel with the rainbow stain caused by heat. It's been saturated to emphasize the colours.